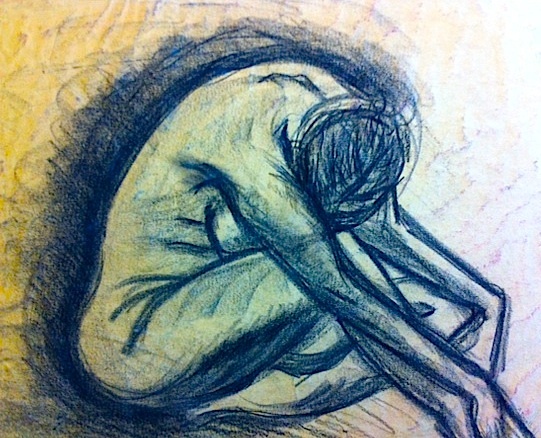 Charcoal figure drawn when Nina was healthy and much younger. This entry was posted in My Art & Writing and tagged art, cancer, death, family, figures, free verse, hospice, lifecycle, love, models, relationships, writing. Bookmark the permalink. Nina is my Godmother. At 81, she has had a wonderful and complete life. The difficult thing is the gene pool – many members on both sides defy their age, in both attitude and appearance. Nina easily passed for 60. She hasn’t suffered long, but she is suffering now. I pray she goes quickly. Cancer is a monster – often times robbing the living of their last vestiges of dignity. Sorry for the woeful post. My posts of late have been a bit morose, as I’ve been going in many weekends – visiting with her. Death is a demon and an angel. The suffering makes it confusing. Thank you. I do appreciate your kindness. Nina is a grand name. wow – I am out of words – this is such touching and powerful!! Thank you. I wish I didn’t have to write this post. Writing does help and what helps more are the kindnesses bestowed by lovely, fellow bloggers like yourself. Sometimes this gigantic, technical blogosphere, can be small, human and comforting. I’m very sorry, AM. Thinking of you and your family …. My heart breaks for my uncle – it’s life, but it’s just very sad at any age. I hope all is okay with you. I’m so sorry, I pray for your godmother, I have never known one who has been through this awful time, but give my dearest love to those who are or have. Send her my condolences. Thank you for being so thoughtful. Thank you for sharing. Thanks also for stopping by my blog. Perused your blog further and it is most excellent. You are quite the prolific writer. Sorrow passes in its own time…but it does pass. Thank you. May they find a cure for the many, many suffering now. Nina was a beautiful woman and our family touchstone. She is sorely missed. Nina was quite special and sorely missed. Thank you for your kind words and reblog. AnnMarie . . . what a lovely remembrance of your aunt. Thank you so much for sharing the love. She was a wonderful lady. Thank you, Ellen. I appreciate your kind words.